Grouper belongs to one the largest fish families (over 400 species) in the Sea, the Sea Bass family (Serranidae). 9 chances out of 10 if you have eaten grouper it has been Red Grouper ( Epinephelus morio) or Gag (Mycteroperca microlepis) which is a member of the Serranidae family. Other grouper such as the Black (Mycteroperca bonaci), Yellow edge (Epinephelus flavolimbatus), Scamp (Mycteroperca phenax) and Snowy Grouper can be found in the market place but in limited quantities, due to the fact that smaller amounts of these species are harvested. The grouper fish is found in the waters of Florida and the Mid-Atlantic States as well as South America, Central America and the Gulf of Mexico. Gag fish will be marketed as Black grouper; they are very similar in taste and texture. Both of these fish have a high oil and moisture content which makes them suitable to cook many different ways. The grouper fish has a mild but very unique flavor, somewhat of a cross between bass and halibut. 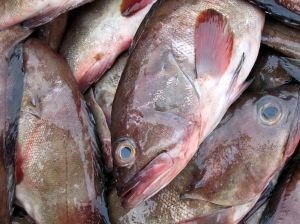 Red grouper is not quite as firm and has a milder, sweeter flavor than Black or Gag. Many chef's and true Grouper connoisseurs prefer the Red Grouper over the Gag or Black. Grouper meat cooks up very firm, with big flakes and holds its moisture better than many other fish. Since Red Grouper is a leaner fish you might need to baste it when broiling or baking it. Probably the two most favorite ways to cook Grouper is grilling or frying it. Other ways you can cook Grouper is to poach, steam, bake, broil and sauté and don't forget that it is excellent soups or chowders. Grouper sandwiches are very popular in the southern parts of the United Sates where fresh Grouper is readily available. Blackened grouper is another southern favorite. If you are baking or broiling Grouper stick to the general rule of cooking fish, which is 10 minutes per inch of thickness. Oven temperature between 400-450 degrees F.
If you are cooking a fillet, I like to take the tail end and fold it over on the fillet to make it thicker, like the rest of the fillet. Remember that your fish will be done when the meat becomes opaque and flakes easily with a fork. If you do find some large fillets make sure to butterfly them first if you are planning on grilling them. The large fillets will be to thick to grill.